Monday – Friday: 9.00 a.m. – 12.00 p.m.
Monday, Tuesday und Thursday: 2.00 p.m. – 5.00 p.m. If you can’t reach us personally, please leave us a message or send an email to kanzlei@britta-best.de. Coming from Homburg/Waldmohr/Brücken by way of Schönenberg-Kübelberg, follow Sander Straße (L356) toward Bruchmühlbach-Miesau. Turn left onto Grieser Straße. After passing the “Gries” sign, turn left at the first opportunity onto Goethestraße. The office is located in house no. 21 on the right side of the street. Coming from Bruchmühlbach-Miesau by way of Schönenberg-Kübelberg, follow Sander Straße (L356) toward Waldmohr/Homburg. Turn right onto Grieser Straße. After passing the “Gries” sign, turn left at the first opportunity onto Goethestraße. The office is located in house no. 21 on the right side of the street. Coming from Börsborn, follow the main street toward Gries and, once you have reached the village, turn right onto Grabenstraße. 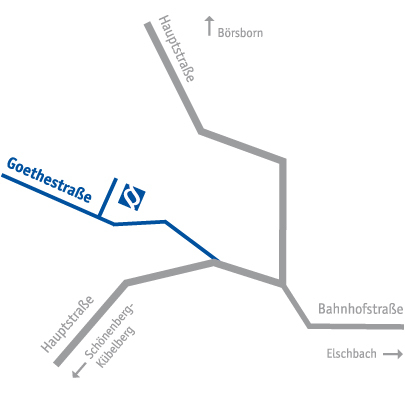 Then turn left onto Goethestraße. The office is located in house no. 21 on the left side of the street. Parking spaces are available to the left and right of house no. 21. A brochure of the law office is available for download here (in German).